This is a simple gift from My Zen Path on the eve of new year – a wallpaper that you can freely download and use it for you laptop, PC or other devices. Please do no modify this wallpaper and keep My Zen path watermark intact on the photo. However, feel free to share it as it is with anyone and use it wherever you want. 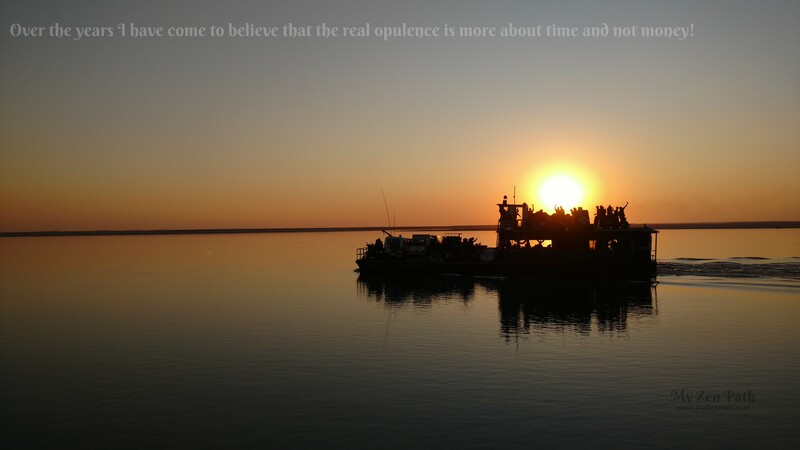 Over the years I have come to believe that the real opulence is more about time and not money. You can recover monetary loss but you cannot recover lost time…. ever! So if you can spend your time doing what you want, I think you’re really fortunate! You can read the complete article to know its context and more examples I have written there. Interestingly, this quote that I have used on this wallpaper was one of the top few searches that lead to My Zen Path early this year. The photo you see in this wallpaper is a sunset captured from another boat in the river Brahmaputra during my travel in the north-east India recently. Sunsets are really special… they remind you of life’s impermanence, and somehow make you ponder what’s really important in your life! I think this photo goes well with the featured quote. You can click on the image below to download the large-sized (5344 x 3006) wallpaper! I hope you can spend more of your time doing what you want to do in the coming new year. Wish you all a very happy and purposeful new year – 2017! Previous Previous post: What makes life worthwhile?